From having a hit record a few years ago as an unsigned artist Jyoti Mishra has returned with an album of strong tracks, and protest songs. Rallying against the illegal war in Iraq (These are the MP’s) anger and defiance against the way this country is being run into the ground by the lying fools that pretend to be new labour are all informing this CD of strong tracks, and stronger words. 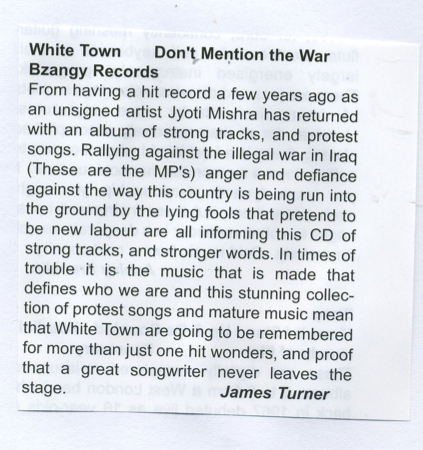 In times of trouble it is the music that is made that defines who we are and this stunning collection of protest songs and mature music mean that White Town are going to be remembered for more than just one hit wonders, and proof that a great songwriter never leaves the stage.